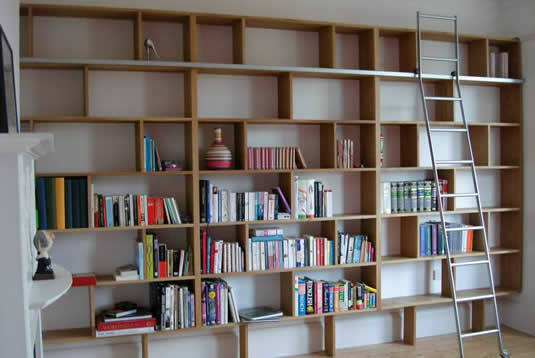 “Carl Hughes designed and installed a bookcase for our study. The work was of the highest quality and we are absolutely delighted with it. Carl is an excellent craftsman, and is punctual, polite, pleasant and reliable. It was a pleasure to have him in our home. 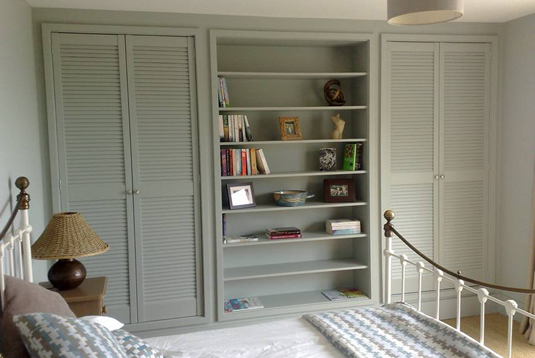 “I would like to thank Carl Hughes Carpenter & Joiner for the fantastic job he did for us in July – building our bedroom wardrobes, drawer unit and bedside cabinets. Carl’s help with the design was invaluable and has provided us with far more space than we thought possible. Carl’s work was to a high standard and the units whilst not cheap will last us for years. They are timeless and made from high quality materials. In the long term they will work out much better value for money than the cheaper products that we looked at. 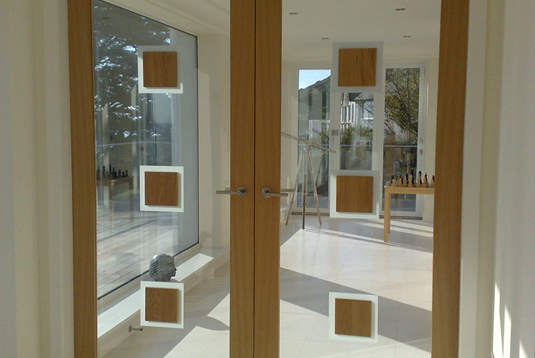 The 8 internal doors that you fitted make the hall look much brighter and fit perfectly. We would highly recommend Carl Hughes Carpenter & Joiner to anyone who needs fitments that are not “run of the mill” but bespoke. We would also recommend Carl for the more mundane of jobs such as the doors he fitted. Mr. and Mrs. P. Waddington. Pensarn, Abergele. “Carl Hughes Carpenter & Joiner has completed a number of carpentry and joinery projects for us, including a made to measure home office. Carl has always been polite and helpful. Carl’s work is to the highest standard. The bespoke nature of Carl’s work means he can do just about any carpentry or joinery project. Carl’s attention to detail is exceptional and results in a very high quality finish. “Carl Hughes Carpenter & Joiner has just completed a built-in wardrobe for me in Rhos on Sea. “When we viewed our current house, we instantly saw the state of the stair rails, which looked wrong and out of character. Being a major feature of any house we wanted to address this and sought a local joiner to carry out the work. Carl Hughes Carpenter & Joiner, was the first to come and view the job and after he left, I knew from his enthusiasm for his work that he was the right man for the job. You need a tradesman to give you confidence in his ability and Carl knew exactly what needed doing and filled me with confidence. “Carl, we just had to thank you again for the brilliant job you did at our holiday home. We thought for such a small job that we may never be able to find somebody who wanted to do this job, but I e-mailed you through your excellent web site and you responded the same day. Within two weeks the job was done and to a very high standard. You are a very knowledgeable, experienced, punctual and a polite man – a true craftsman in fact. 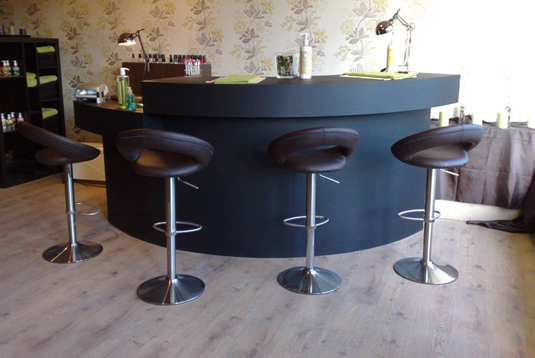 “I was very impressed with the work Carl Hughes Carpenter & Joiner carried out to the flooring in my bathrooms. I was especially pleased with the fitting of white plastic decorative panels, which Carl used to cover a boxed unit, to hide pipe work. Carl was very thorough, neat and tidy and meticulous to the detail in his work. I will definately contact Carl again for any future work and would highly recommend Carl Hughes Carpenter & Joiner to others. “After an initial meeting regarding the fitting of bespoke wardrobes and shelves into an awkward shaped loft conversion, Carl Hughes Carpenter & Joiner was able to produce a computer assisted drawn impression of the format for discussion. 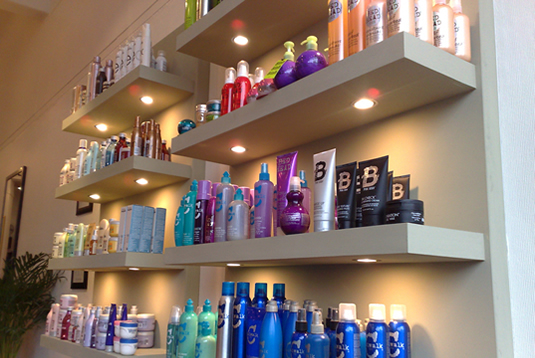 This enabled us to come to a practical and attractive solution to maximising the limited space. With discussions each morning, during the progress of the work, further ideas and improvements to the plan were developed. Throughout the whole process, Carl was very flexible and diligent in the execution of the details. By applying the standards and finish of furniture and cabinet making to bespoke fitting, Carl was able to create a unique solution to a challenging area. Mr. & Mrs. R. Irvine. Upper Colwyn Bay. “We want to say a big thank you to Carl Hughes Carpenter & Joiner, whom we commissioned to create loft access, to make our roof space an accessible storage area and also to fit solid oak flooring in our hallway. We are thrilled with the results. Carl has transformed the once unusable, inaccessible space in our loft into a sensational contemporary bright airy storage room, with a beautifully fitted Velux window and bespoke fitted concealed storage cupboards. The solid oak flooring is equally breath-taking; Carl’s attention to detail is staggering and it is that attention to detail which gave our solid oak floor the wow factor. Carl is a true professional in every sense of the word; from the moment the work was discussed with Carl it was a full cradle to grave experience. The quote was so professionally laid out itemizing everything, so we knew exactly what we were paying for. We could not ask for better communication. Carl kept us fully informed before and during the job of exactly what was going on and what would be happening next. Carl worked really hard to achieve the results. We are truly thrilled; Carl is an honest, hardworking, totally reliable and exceptional carpenter and joiner. We have saved Carl’s number in our speed dia,l as without doubt we will be using Carl for many years to come and would not hesitate to recommend Carl to family and friends. “We would like to thank Carl Hughes Carpenter & Joiner for all his hard work and professionalism. We commissioned Carl to produce a set of bespoke internal double doors. He produced a fantastic finished product and we are delighted with the results. Carl kept us advised at all times, liaised with other parties to ensure our requirements were being met and was prompt on all occasions when visiting. When he came to hang the doors, he worked extremely hard to get the job done and was a perfectionist in making sure it was done right. “We would like to thank Carl Hughes Carpenter & Joiner for the work he has just completed at our home in Rhos on Sea. “We would like to thank Carl Hughes Carpenter & Joiner for the fantastic job that he did on our staircase. Carl completely exceeded our expectations and we’re absolutely delighted with the end product. We will confidently recommend Carl to anyone. His attention to precision and detail is second to none. Carl went above and beyond to give us the best possible job at a very keen price. Carl is indeed a very talented, creative and passionate craftsman. A genuine, honest hard working person. Always clean and tidy, with a very pleasant manner. “We would like to thank Carl Hughes Carpenter & Joiner for giving us a brilliant kitchen, utility and W.C. makeover. Carl’s personal consultation and advice during the planning stages were both innovative and invaluable. We appreciate that Carl gave up many hours of his time to ensure that we were happy with the plan and costing. We love the final result, especially the oak worktops, oak floor and all the bespoke elements, i.e. the bespoke radiator cover/window seat, carcase construction and clever integrated appliances. “Carl Hughes has just finished a major refurbishment of my apartment and the results are outstanding. He has laid a solid oak floor throughout, fitted new oak fire doors, replaced all the skirting boards, constructed a wardrobe with sliding doors, reconstructed the loft hatch, installed some huge wall mirrors and built an ultra-modern, high-gloss white kitchen. The results of all the work are superb and are a testimony to his craftsmanship, hard work and attention to detail. I had contemplated doing these jobs several years ago, but had put them off, because I wasn’t confident in finding someone who would do the work to the required standard. Finding Carl changed all that, and I would very happily recommend him to anyone who wants an exacting, professional job done. Throughout the process, Carl has been a pleasure to work with. Nothing is too much trouble and I am absolutely delighted with the results. 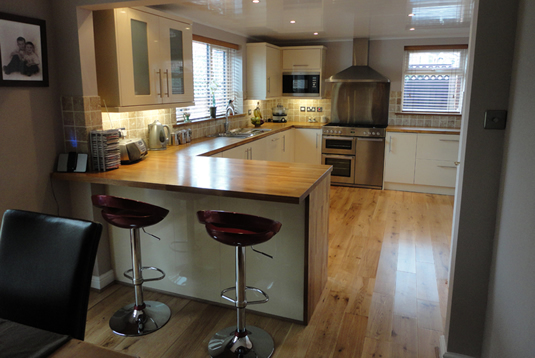 “Carl Hughes has recently fitted a new kitchen for us and the results are stunning. From when we first met Carl Hughes, he helped plan the job and made sure everything ran smoothly. The quality of his workmanship is excellent. “Carl Hughes Carpenter & Joiner recently completed a major refurbishment to our property. We can only describe Carl as one of the most genuine/reliable and hard working craftsman we have ever met. Throughout the project, Carl has been an utter professional, offering advice when needed and listening attentively to our requirements. The manner in which Carl goes about simple tasks as well as the larger projects, has illustrated to us that he is one in a million. Carl managed the entire project, liaising between us as the customer and other tradesmen including builders, plumbers and electricians. Carl demanded high standards from all other tradesmen which made us feel at ease, knowing that he had our interests at heart. “Our home has recently undergone a complete programme of refurbishment by Carl Hughes Carpenter & Joiner. Carl Hughes completed the task efficiently and to a very high standard. His quality of work and attention to detail, combined with his friendly, yet professional approach ensured we had minimum disruption during the refurbishment. “We endorse the joinery and workmanship skills displayed by Carl Hughes who has completed several jobs in our house over the past year. Carl Hughes was recommended to us by friends who have exacting standards and so we knew that a commendation from them would be praise indeed! Carl Hughes has replaced our internal doors with oak doors, handmade a fitted bookshelf in our study, laid flooring in two of our bathrooms, laid an oak floor in the hallway and flooring in the kitchen. Carl’s work is of a consistently high standard and his work ethos is exemplary: nothing is too much trouble. Carl always arrives for a job exactly when he’s promised and will work seven days a week to complete the task quickly, thereby minimising disruption. “Carl Hughes is a good, reliable carpenter/joiner that will undertake any project in the home. Carl Hughes has recently fitted a kitchen and utility at our home and carried out a full refurbishment. “Trustworthy and punctual; if he made an appointment, he arrived on time. “In my quest to find the expertise required for my prestigious project, I found that Carl Hughes was the only local craftsman who was able to prove his attention to detail, pride in his job and quality of workmanship. “Carl Hughes was recommended by a friend. We wanted someone who would make us a bespoke kitchen and scullery (or utility room if you prefer) for little more than an off-the-shelf price. Not only did Carl Hughes deliver – he also put up with my Wife’s changes of mind at various points.